Zone Therapy is a form of healing designed to balance your brain and align your spine so that your body can restore itself to maximum health. The human brain has six centers that form in the embryonic stage of development that are responsible for maintaining your health. What happens during zone therapy? 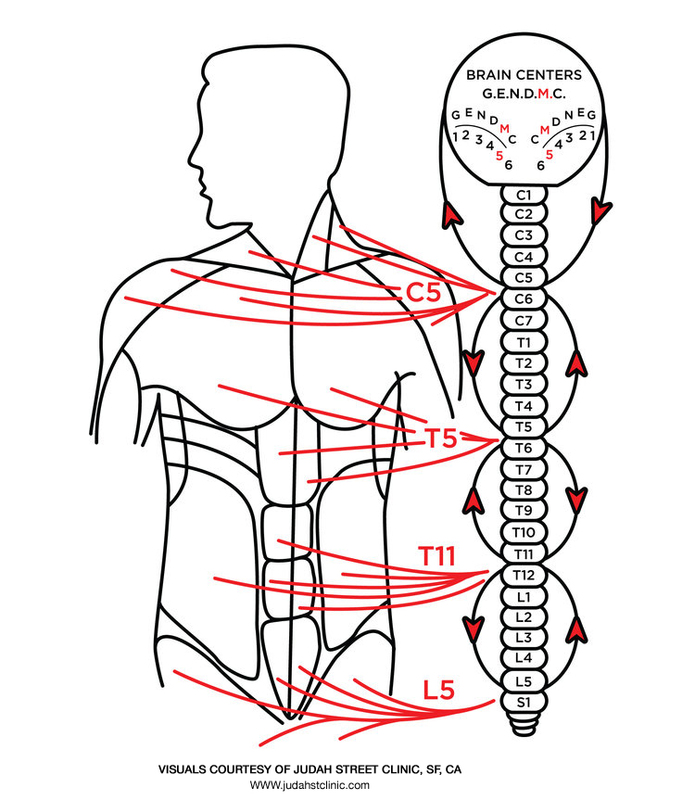 Your body may be properly classified as an electrical machine and the six brain centers represent the positive pole, while specific points in the spinal cord represent the negative pole. Each zone regulates and influences your overall health. All diseased conditions, aches and pains, and other discomforts experienced by the body can be attributed to one or more of the zones. In order to locate the zone that is out of balance, there are six zone points on the head corresponding to each zone that are touched with slight pressure. The point where you feel discomfort indicates the zone that is out of balance with the bodily systems its controls. 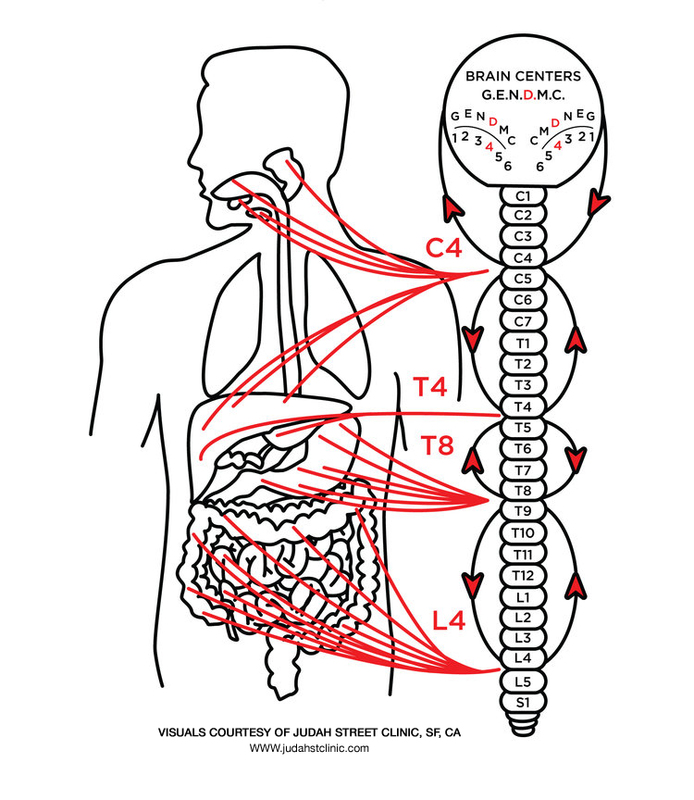 Once the zone has been identified stimulation of points along the spine sends healing energy up the spinal cord to the brain to create balance. The brain center sends out signals to the imbalanced system to promote healing. You will be given a zone slip which outline possible changes you might notice after your treatment. Thinking about these changes will make them a part of your consciousness and help to stimulate healing. An imbalance in one or more of the zones can create symptoms in the body from headaches and pain, to indigestion, depression and insomnia, In order to correct a disturbance zone therapy it used. All of the glands in the body are regulated and controlled by the glandular center in the brain.When any of the glands of the body have been disturbed by trauma, shock, disease or strain, there will be a reflex nervous action along the nerves. The eliminative zone is responsible for removing waste products from the body. Principal organs involved are the sinuses, lungs, urinary tract, bowels and skin. Adjustment of this zone encourages increased excretion from these organs which due to a disturbance have inhibited function. The fifth zone coordinates and regulates the muscles of the body. The activity of this center is largely of a reflex nature in origin and is excited by impulses which come to it from peripheral organs. Any injury or shock, will distort the normal functioning of the fifth zone, resulting in a disruption of not only the equilibrium of the body but also a displacement of the center of gravity. Tenderness is evident, and the tender side will be in a state of contraction. 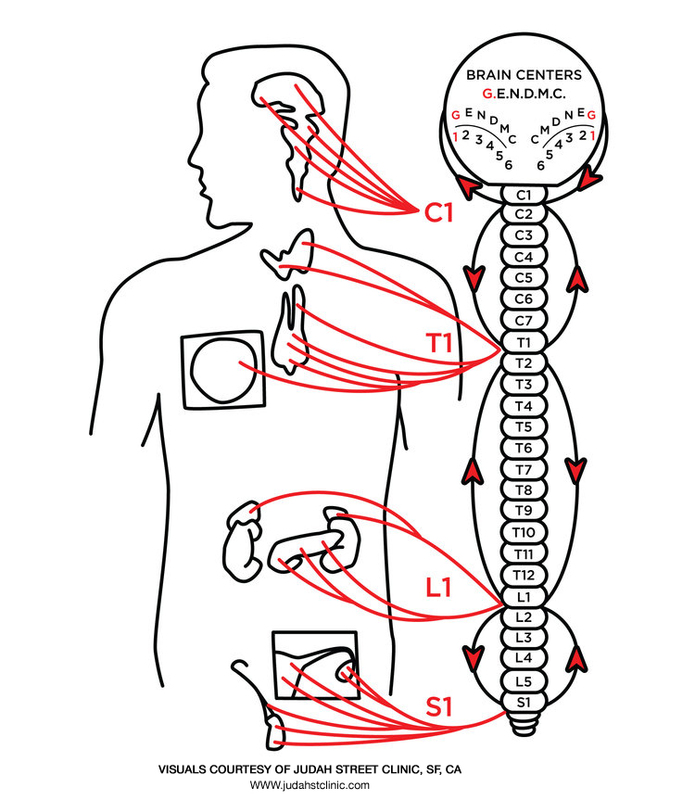 The traditional chiropractic’s techniques concerns itself with the correction of these bodily displacements. Tissues and organs of the body are dependent on not only the presence of blood but its continuous movement as well. This is regulated by the circulatory zone. Blood is kept in continuous movement by the heart, a central double organ. The heart pumps blood through arteries and it is then further distributed through a network of capillaries to organs and tissue. The minute capillaries vessels permit the passage of nutritive materials into the tissue spaces and the veins collect and return the blood to the right side of the heart. Blood therefore moves in a cycle and the movement is termed circulation. When any of the arteries, capillaries or veins contract or become too stretched the pressure must be changed to compensate them. Conditions such as high or low blood pressure or varicose veins can occur.